Wenzel Bilger is regional program director of the Goethe-Institut New York. Lumi Tan is an assistant curator at The Kitchen in New York and associate editor of The Exhibitionist: Journal for Exhibition Making. Hrag Vartanian is a Brooklyn-based writer, editor, and critic. He is the editor of Hyperallergic and a member of the Triangle Arts Association board. 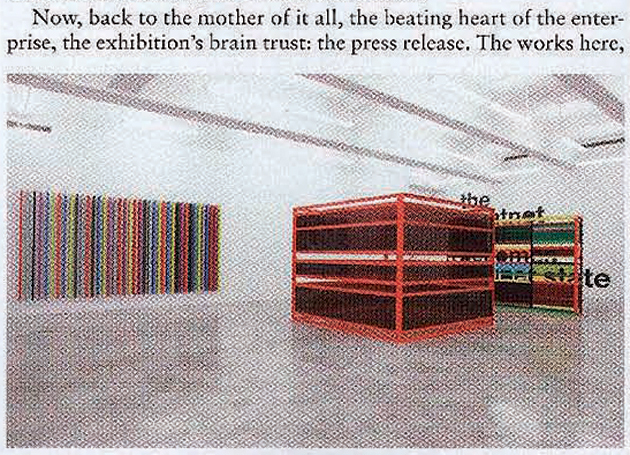 April 6, 2013 4–6 p.m.
Joshua Decter, "Reviews: Liam Gillick at Casey Kaplan," Artforum, October 2008. "International Art English," published in Triple Canopy in July, has circulated widely and generated debates about the relationship between language, legibility, and power in the art world. The authors of the article, Alix Rule and David Levine, analyze a corpus of press releases circulated by e-flux in order to describe the language of contemporary art. They trace the particularities of this language to English translations of critical texts published in the 1970s in journals like October. The widespread use of the Internet has, they argue, accelerated the development of IAE, turning it into a kind of lingua franca; the proliferation of international variations—French IAE, Scandinavian IAE, Chinese IAE—ends up diluting the authority of critics, "traditionally the elite innovators of IAE." Given these developments, Rule and Levine ask: "Can we imagine an art world without IAE? Without its special language, would art need to submit to the scrutiny of broader audiences and local ones? Would it hold up?" With this forum, Triple Canopy hopes to provoke a critical response to the article, consider questions and perspectives eschewed by the authors, and solicit the perspectives of those who work with (or resist working with) IAE, whether they are critics, curators, educators, or publicists. Specifically, the discussion will focus on the political implications and uses of IAE, within and outside of the art world. "Thanks to International Art English, the artist can still appear vaguely subversive and the host state committed to openness, a mutual saving of face," writes Mostafa Heddaya in a recent essay for Hyperallergic. How does such "critical" language direct attention away from the suppression of political dissent, especially when employed by institutions—and their proxies—operating in environments marred by human-rights violations, such as China and the UAE (or even the US)? How does obfuscation slip into propaganda? And do those who regularly produce IAE experience the language as burdensome or liberating, a welcome tool for the diffusion of power or another step toward a global standard of ambiguity and opacity?